Yesterday I celebrated my 26th birthday and I’ve made a little vlog featuring just a taste of the fun I had. I started the day being spoilt by my husband, had a birthday brunch with friends, went vintage shopping, visited family, enjoyed free churros from San Churros, and then relaxed the rest of the evening with my puppers and husband. I’ve received so many birthday message, and feel so blessed. Thank you for all the birthday love! 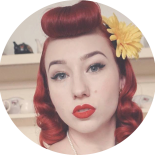 This entry was posted on September 6, 2018 by Miss Lady Lace in Pinup, Pinup Life, Videos, YouTube and tagged 1940's, 1950's, birthday, birthday video!, birthday vlog, blogger, glamour, miss lady lace, miss lady laces pinup blog, perth, perth pinup, perth pinup blog, perth pinup community, pin up, pinup, pinup blog, pinup blogger, pinup fashion, pinup girl, pinup life, pinup lifestyle, pinup perth, red lips, retro blog, retro girl, retro glamour, the perth pinup community, victory rolls, vintage, vintage blog, vintage blogger, vintage fashion, vintage girl, vintage glamour, vintage perth, vintage pinup blog.